The top amount greater Boston artists can receive from Creative City Boston—a grant from the New England Foundation for the Arts building from its Creative City program—will double to $20,000, the Boston nonprofit announced today. That’s thanks to $950,000 contributed by Boston’s Barr Foundation, the program’s primary funder, the two nonprofits reported. “We learned that investing in socially-engaged artists is a powerful way to spark dialogue and drive community change, contributing to a stronger city overall,” San San Wong, Barr’s director of arts and creativity, said in a press release. The announcement arrives with the release of two reports from the nonprofits that were developed to guide the future of the Creative City programs. The first report offers an overview of the Creative City program, which funded 46 projects with grants of $2,500 to $10,000 between 2015 and the end of last year. 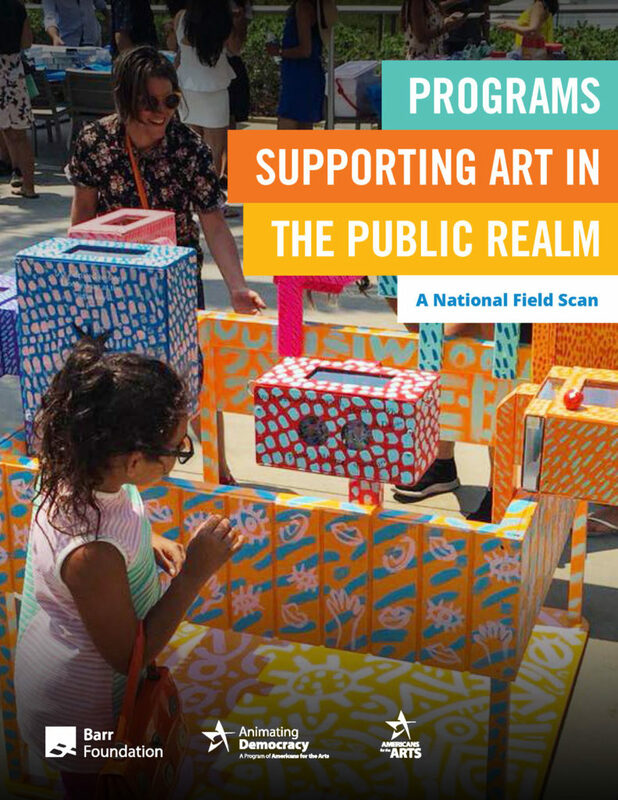 The second report, “Programs Supporting Art in the Public Realm: A National Field Scan,” was commissioned by Barr from Americans for the Arts to collect insights from 28 related programs across North America. Creative City aimed to address “limited access to the arts in historically underserved Boston neighborhoods, few opportunities for artists to experiment and create new work, lack of imagination and community engagement informing Boston planning initiatives, and limited examples in the city of compelling public art that foregrounds public engagement,” Kim Szeto, program director of public art at New England Foundation for the Arts, says in the report. Creative City grantees ranged from Ifé Franklin’s “Indigo Project,” in which she built “ancestor slave cabins” and had a ring shout in Boston’s Franklin Park (pictured at top), to Paloma Valenzuela’s “The Pineapple Diaries,” a web comedy series about three friends in the predominantly Latinx neighborhood of Jamaica Plain. For a performance in Roxbury, Castle of our Skins, co-founded by classical musicians Ashleigh Gordon and Anthony Green, put out a call to composers worldwide to take a piece of writing by a black author and set it to song. Artists Elisa Hamilton and Silvia Lopez Chavez created a “Lemonade Stand” installation that offered “an invitation for people to reflect on stories of turning lemons into lemonade.” Jillian Wiedenmayer painted a mural along the pedestrian bridge connecting Lincoln and Cambridge Streets in Allston. Wen-ti Tsen created life-sized portrait cutouts of Chinese immigrants who arrived to Boston a century ago and installed them throughout Chinatown. The foundations note that 67 percent of grantees self-identified as people of color. The “Programs Supporting Art in the Public Realm” report suggests that Creative City is following successful practices of community arts projects from around North America that aim to reach under-represented groups and serve communities. Because community arts projects are “more resource intensive,” the report says, grantors have decided to play “a more active role in the creation of partnerships, providing professional development, and when possible, by increasing the amount of money awarded.” The projects they surveyed tended to be focused on partnerships with artists or community organizations, they said. And projects are often tweaked at least once a year to improve them as overseeing agencies learn more about community arts programming. • Increased grant amounts for both artists (from up to $10k to up to $20k) and community partners (from $1k to up to $5k). • A concept proposal phase “to lower the barrier for entry”—finalists will receive assistance and mentorship from advisors and staff prior to submitting a full project proposal. • Expansion of the cohort-learning model to include artists and community partners engaged in the awarded projects. In addition to Creative City Boston, NEFA says it plans to increase professional development and field-building opportunities and launch a Public Art Learning Fund, a new grant for training New England artists in public art practice. Disclosure: I received a 2017 Live Arts Grant from The Boston Foundation, which it says was “created with the support and partnership of the Barr Foundation and the Wagner Foundation.” And folks I’ve collaborated with have received funding from Barr or the New England Foundation for the Arts. For example, WBUR. Also, I’m currently working with the Essex County Community Foundation’s Creative County Initiative, a project financially supported by the Barr Foundation.